Napoli left-back Faouzi Ghoulam has emerged as a surprise target for Manchester City in the winter transfer window. Manchester City will look to sign Napoli left-back Faouzi Ghoulam, according to the football transfer rumours in Italian Media (TMV). The Algeria international was signed by Napoli in January 2014 from Saint-Étienne for a fee of 5 million euros. The 26-year-old has a valid contract with Napoli until June 2018. 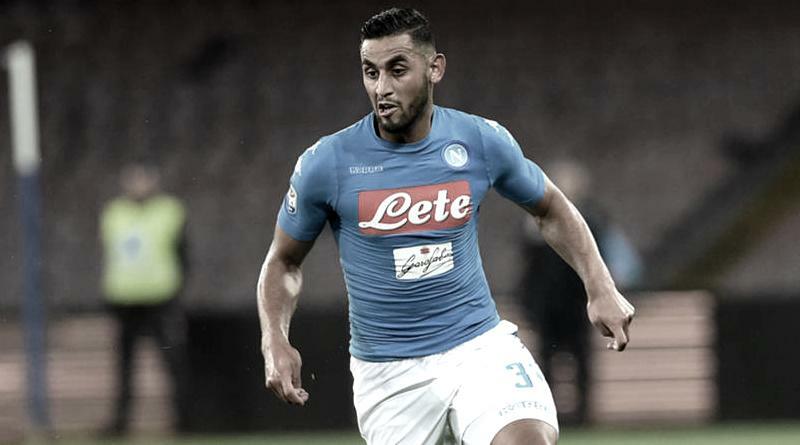 Since his arrival from Saint-Étienne, Faouzi Ghoulam has scored two goals and provided 24 assists in 147 games for Napoli, including two goals and provided four assists in 11 games in all competitions this season. The Algeria international has been in fantastic form for Napoli this season. As a member of Algeria national football team, Faouzi Ghoulam has won 37 caps and has scored 5 goals. The left-back’s contract at Napoli is about to expire and a number of clubs are said to be monitoring his situation, with Manchester City showing the most concrete interest in an attempt to lure the player to their team. Pep Guardiola wants to sign a new left-back this winter and Faouzi Ghoulam is one of the names at the top of his wishlist. The report claims that Manchester City manager has extensively scouted Faouzi Ghoulam and is considering a move for the left-back. The Algeria international is thought to perfectly fit the profile of defensive player Pep Guardiola wants to target in the winter transfer window. Manchester City will be desperate to make an impact in winter transfer window. According to the report in Italian Media, Faouzi Ghoulam is out of contract at the end of the season and could be available for a bargain fee. The Algeria international has already been linked with Liverpool and Chelsea. How strong that interest is and whether Manchester City will make a winter move remains to be seen but it is certainly one worth keeping an eye on.